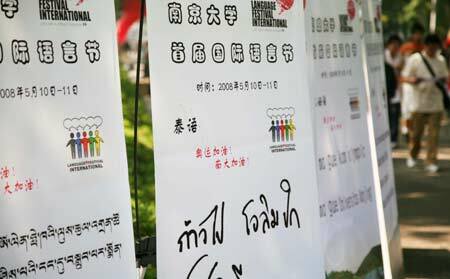 Posters of the International Language Festival are seen in the photo taken on May 10, 2008 in Nanjing University, Nanjing, capital of east China's Jiangsu Province. About 200 free language classes of over 60 languages will be open to language lovers during the two-day festival. 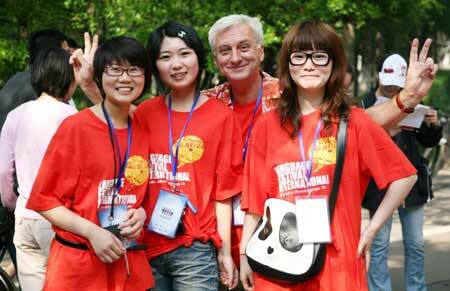 A foreign teacher poses for a group photo with staff members of the ongoing International Language Festival in Nanjing University, Nanjing, capital of east China's Jiangsu Province, May 10, 2008. About 200 free language classes of over 60 languages will be open to language lovers during the two-day festival. 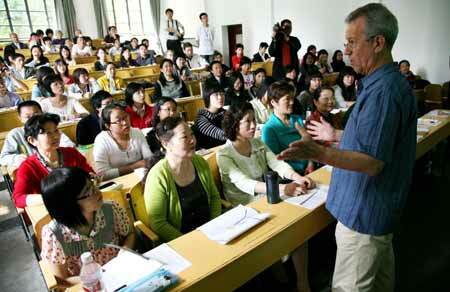 A foreign teacher gives a lecture for language lovers on the International Language Festival in Nanjing University, Nanjing, capital of east China's Jiangsu Province, May 10, 2008. About 200 free language classes of over 60 languages will be open to language lovers during the two-day festival.